There is only one thing I don’t like about hostas… their susceptibility to slug damage. I don’t use poisons on my gardens, so I have spent a lot of time researching natural methods for eradicating slugs. During those first few years I think I must have tried them all. I put copper strips around each hosta. I left a solution of yeast, honey, flour, and water in small containers embedded in the soil… I did the same thing with grape juice… and with beer. I scattered coffee grounds… sand… wood ashes… and crushed oyster shells. One year we even spent several hours every day picking slugs by hand. Our goal was to fill a small container each day (in its previous life an 8.1 ounce baking powder can)… and the next day we would fill it again. Despite everything, my hostas were still always full of holes. Then I discovered iron phosphate. It was a perfect solution… a naturally occurring product that was advertised as harmless to everything except slugs and snails. A few sprinkles of iron phosphate pellets around each plant and my hostas stayed beautiful all summer long. Iron phosphate is non-toxic to both humans and dogs, as well as other pets and wildlife… How can these baits made of nothing but iron phosphate and wheat gluten be as effective as they are shown to be when other studies show that snails can live indefinitely on a diet of iron phosphate? … Enter a man-made chemical called EDTA, a chelating agent that causes the iron phosphate to release its elemental iron easily in the digestive systems of not only slugs and snails but of pretty much anything that eats it… Once you know that EDTA is present in the bait, the mode of action becomes clear pretty quickly — iron poisoning. (Product name) contains wheat gluten which is the same to make spaghetti. It also contains iron phosphate as the active ingredient. No EDTA. (Product name) controls only two things – snails and slugs. So what do I do now? I have an almost full container of iron phosphate pellets left from last year. The label does not list EDTA… the company tells me that this product does not contain EDTA. Here’s the problem… I know the product works, and yet research shows that slugs thrive on a diet of iron phosphate and that iron phosphate alone does not kill slugs. Certainly the above mentioned added wheat gluten is not going to do it. So what does that mean? Can I trust the label and the company… or not? Do I continue to use the iron phosphate? I’m definitely not going to knowingly do anything that will hurt the birds, the squirrels and chipmunks, the frogs, toads and salamanders, or the earthworms. I think I’ve just answered my own question. I use this stuff but I didn’t know about the danger. I appreciate knowing because like you I don’t want to hurt the other creatures that live in my garden. I don’t know who we should believe. I thought it was a law that companies couldn’t say something was in a product if it was but is that still true? For now I won’t be using the iron phosphate product. Shirley – which of the natural slug methods did you feel worked the best? Bethany, I think they all probably work to some extent if you have only a few hostas and you’re really diligent about reapplying them. I really can’t say which method I think works the best, but perhaps the crushed oyster shells around each plant. That got to be expensive though, and when fall leaves more or less covered the oyster shells, it was difficult to remove the leaves only. I didn’t have much luck with the beer or the flour, sugar, honey, yeast solution. Those did attract a few slugs, but we had so many… they didn’t really make much difference. Maybe someone reading this will have better recommendations that they have tried and found to be effective? Oh no. I’ve been so pleased to have my hosta’s free of slug damage. I’ve been using a commercial brand for years and I won’t mention the name because I can see that you have been careful not to. And now I am wondering if I have killed other things because of using it. I have seen birds carrying the pellets off and we always have toads under our hostas. I hope I didn’t harm any of them. It just makes me so mad that we can’t trust anything anymore. This is terrible. The container says safe to wildlife and pets, and I believed them. I won’t be using this product again, that’s for sure. Thanks for the heads up. 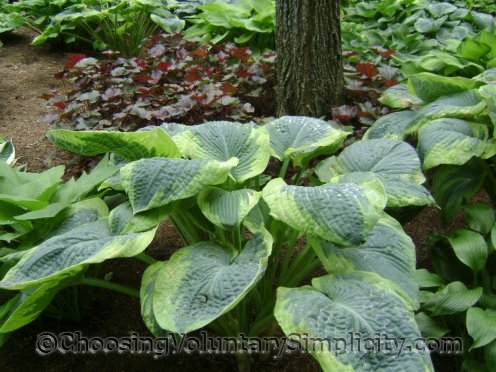 BTW my dream is to have hostas that look like yours.